Ambulance officer details fatal crash scene: Queensland Ambulance Service senior operations supervisor Peter Crooks talks about a a single vehicle fatal crash on the Gore Hwy near Westbrook. UPDATE: The man killed in a crash on the Gore Hwy this morning was from Wilsonton Heights, police have confirmed. Investigations into the cause of a fatal crash at Westbrook this morning are continuing. The 31-year-old man was killed in the single vehicle rollover on a straight stretch of the Gore Hwy near Moore Rd about 6.20am. The man was trapped in the wrecked vehicle. The 27-year-old woman driver, also from Wilsonton Heights, and four children were able to free themselves from the overturned vehicle. Three children all aged under 10 years were taken to Toowoomba Hospital for treatment of minor injuries. The woman driver and a fourth child, also under 10 years, were not injured. The highway was closed for about four hours as investigators worked to determine the cause of the crash. Fatal crash on Gore Hwy, Westbrook: The scene of a fatal traffic crash on the Gore Hwy. EARLIER 10AM: Forensic Crash Unit investigators remain at the scene of a single vehicle crash that claimed a man's life this morning. Four children and a woman have been taken to Toowoomba Hospital with serious injuries. Queensland Ambulance acting senior operations supervisor Peter Crooks said the man was pronounced dead at the scene. x"On arrival our crews there found a car that had tipped over at speed," he said. "In that car they found a male that was pronounced deceased at the scene. "We have transported from that scene a female of unknown age with facial injuries and four children." Mr Crooks said an advanced care paramedic and one ambulance crew were among the first responders before calling for a second crew. One of the four children had serious injuries. Investigations into the crash are continuing, and Mr Crooks urged drivers to be mindful of the Fatal Five. "Just take care and arrive home safely, even if it is a bit late," he said. Diversions around the crash site near Moore Rd off the Gore Hwy west of Westbrook remain in place. Traffic control remains in place. 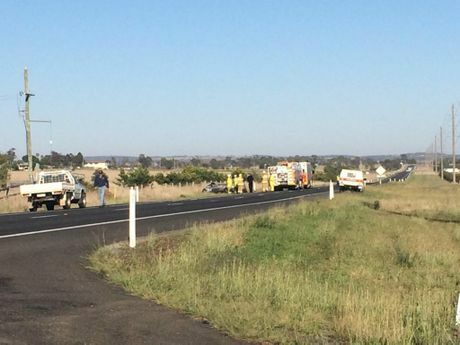 EARLIER 7.52AM: A man has died in a single vehicle crash on the Gore Hwy near Westbrook. Four children have been injured along with a woman, believed to be 20 weeks pregnant. Two children have been taken to Toowoomba Hospital in a stable condition. All the children suffered minor injuries. The woman was also transported to Toowoomba Hospital with facial injuries. The crash was reported to the Queensland Ambulance Service at 6.19am. The Gore Hwy is closed at this time. Traffic is being diverted up Moore Rd.